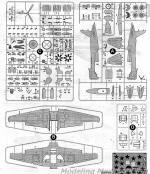 In 1936, Joseph Stalin released a requirement for a multipurpose combat aircraft. Codenamed Ivanov, the airplane had to be capable of performing reconnaissance and then attacking the targets it located. P.O. Sukhoi was working in the Tupolev OKB at the time and designed the "Ivanov" aircraft under the tutelage of Andrei Tupolev. The resulting ANT-51 flew on 25 August 1937 with M.M. Gromov at the controls. Powered by an 610 kW (820 hp) Shvetsov M-62 air-cooled radial engine,the ANT-51 reached 403 km/h (220 kn, 250 mph) at 4,700 m (15,420 ft). This was considered insufficient but since the basic design was sound, it was decided to re-test with a more powerful engine. Equipped with a 746 kW (1,000 hp) Tumansky M-87 engine, the ANT-51 reached 468 km/h (255 kn, 290 mph) at 5,600 m (18,370 ft) and was accepted into production as BB-1 (Blizhniy Bombardirovschik; Russian: Ближний Бомбардировщик — Short-range Bomber). In 1940, the aircraft was renamed Su-2 and the unreliable M-87 engine was replaced with a Tumansky M-88. This lightened version with a M-88B engine reached 512 km/h (275 kn, 320 mph) in testing. 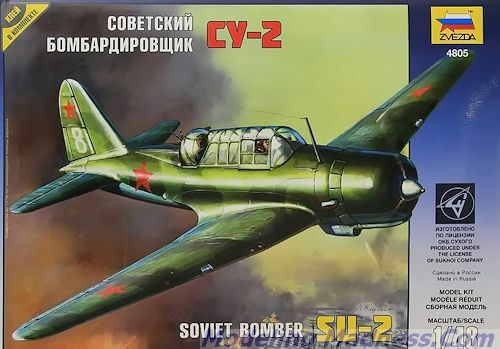 Although 910 Su-2s were built by the time production was discontinued in 1942, the aircraft was obsolete and underarmed by the start of the Great Patriotic War. In combat the Su-2 ground attack aircraft squadrons suffered heavy losses against the Germans, with some 222 aircraft destroyed. From 1942, the Su-2 was withdrawn from the front line and replaced by Ilyushin Il-2, Petlyakov Pe-2 and Tupolev Tu-2 bombers. The Su-2 was relegated to a training and reconnaissance role. However, due to a critical shortage of aircraft in early World War II, some Su-2 were used as emergency fighters. To be honest, I was quite surprised when I heard that Zvezda was going to do a 1/48th Su-2. There are several reasons. One is that it was pretty much a failure in its assigned mission. The other is that there are not many alternative versions to kit. Only the one off Su-4 and the proposed Shb. Now there was a prototype that was powered by an in-line engine and the prototypes of the Su-6 were developed from this airframe so perhaps that is what Zvezda has considered. Even if not, it is rare for any company to produce a one-time kit of anything, especially one as complex as this one. However, if Zvezda is planning on producing 1/48 kits of Soviet single engine props, then it makes perfect sense. There are three grey and one clear sprue in the box. Aside from the clear sprue, none of the others are packaged and are free to rattle around in the box during shipping. 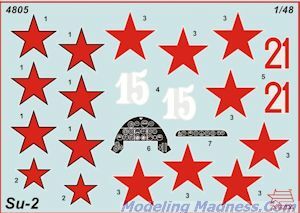 With the sprues snagging each other, it is not surprising that several parts departed the sprues and several of the very fine ones were broken. Zvezda isn't the only company that does this and I think it does little more than discourage modelers from purchasing their kits if they know they will have to repair bits before the build even begins. Whether this lack of packaging is due to a legal requirement to use less plastic or to save a few cents, it should be reconsidered. Anyway, the parts are superbly molded and my kit was free from flash. There are ejector pin marks on the inside of all the large parts, including the fuselage halves and inside the gear doors. A nicely done cockpit is provided with a tub into which fits seats, stick, pedals and an instrument panel with raised detailing. A decal can be used if one so wishes. The engine is very nicely done with separate push rod pairs. These fine pieces are some of which were broken during shipment. The engine cowling is three pieces without a separate cowling front so getting a clean cowling lip will be quite a challenge. The wings are a complete upper and lower half and onto this is where the cockpit and the bomb bay are fit. In fact, the bottom of the cockpit assembly is the bomb bay. A nice selection of bombs is provided and one can pose the by doors open or closed. There are also wing racks if you wish to use them and for this you need to open up some holes. Before going much further, I should mention that the kit can be built wheels up, and while the stand is an optional piece that needs to be bought separately, it is an option. When building the kit one needs to know in advance how the kit will be displayed as there are some alternate bits to be installed. The turret can be built either fully enclosed or opened and there is a gunner, who is molded standing. A pilot figure is also included. The upper transparencies provide two different options as well. One is fully closed and the other has a piece that is molded with the forward canopy slid back over the rest of the greenhouse. This is a nice idea, though it will be tricky to paint the underside framework. Landing gear are nicely done and you are provided with both open and closed gear doors. For in-flight display, the bomb bay doors have to be closed as that is where the stand mount goes. Instructions are nicely drawn with Humbrol paint references. Markings are provided for two aircraft. One is the box art plane from the 210th Bomber Regiment in late 1941 while the other is in a winter scheme during 1941/42. The decal sheet is nicely printed and quite matte. Soviet WWII enthusiasts will definitely want to get this one. It is nicely detailed and will make into a somewhat large model when you are done. 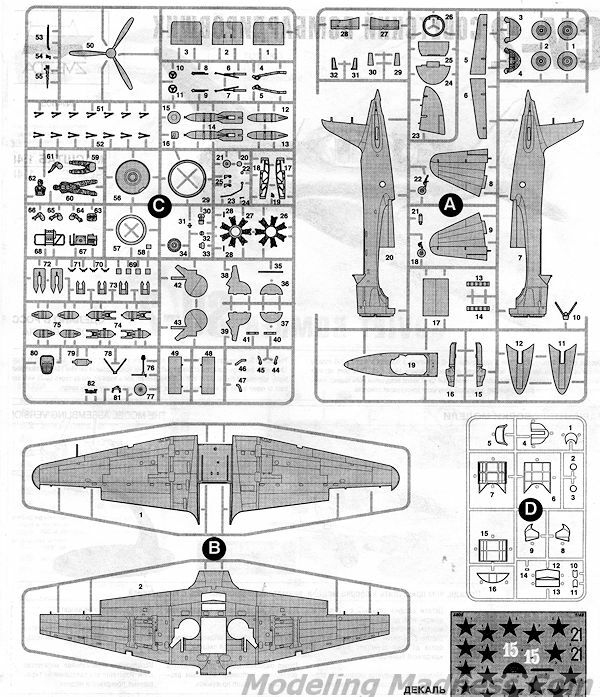 Based on how well other Zvezda 1/48 aircraft kits go together, I expect this one to be equally as nice.